IF YOU'RE LUCKY ENOUGH TO BE AT THE BEACH .... YOU'RE LUCKY ENOUGH! Blessed that my parents brought me to Panama City Beach back in the 80's, and introduced me to the Sugar White Beaches and Aqua Blue Waters of the Gulf of Mexico. We have spent Spring Break at Panama City Beach every year since then. It is our family tradition. When I grew up and got married, I continued the tradition with my husband and five children. 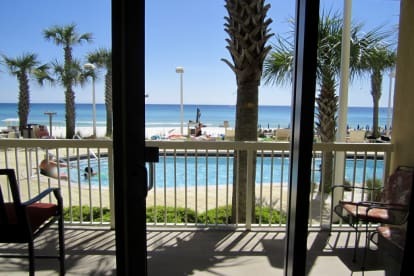 After renting condos for over 30 years, we fell in love with a first floor condo at Calypso Resort, where you can walk to everything at the fabulous Pier Park! My parents bought a beach condo in 2001, then my sister bought a condo at Calypso in 2006, and finally in 2013 my dream came true when we purchased our Calypso condo that we call "BEACH HOUSE ON THE MOON". Our entire family, and lots of our friends enjoy vacationing together year after year - making memories that will last a lifetime! Beach Life is GOOD!